I was recently contacted by the nice people at Chimasu asking me if I would like to sample one of their oriental snack boxes. Of course, I said yes! Om nom nom. 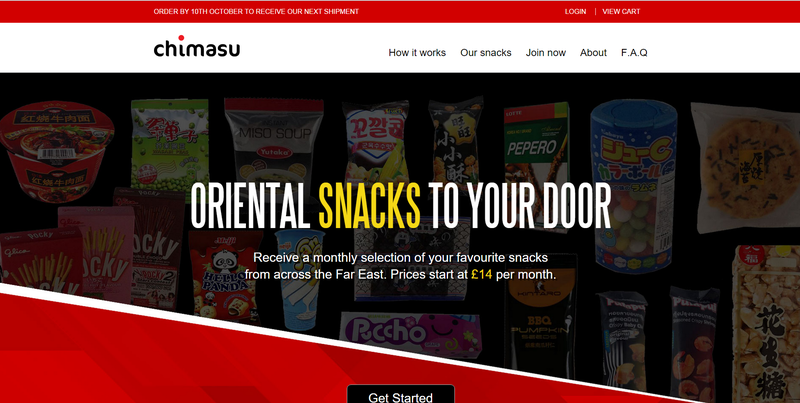 Chimasu.com was started by two friends who loved the snacks they discovered whilst travelling in East Asia and wanted to share the joy with everyone when they returned to the UK. 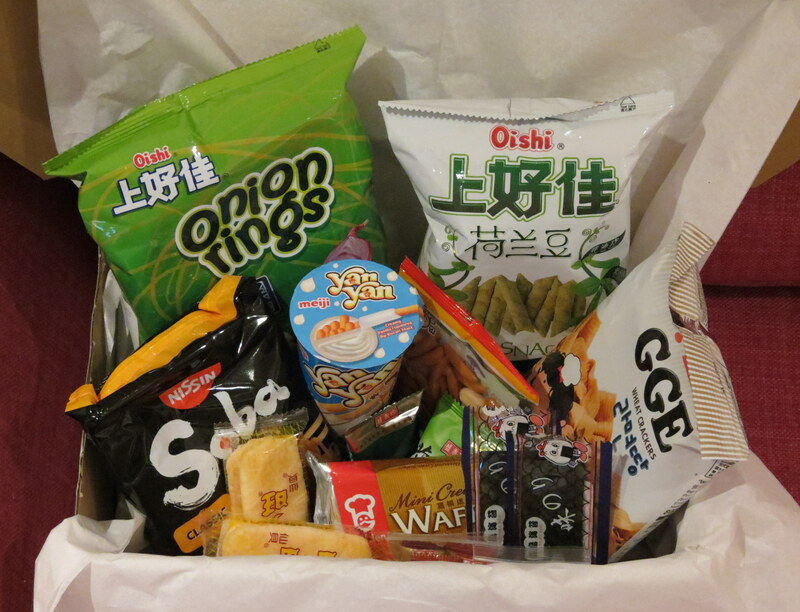 Through Chimasu.com you can subscribe to a monthly delivery of snacks from countries including Japan, China, Taiwan, Indonesia, Thailand, Vietnam and Singapore. Each box is hand picked for the subscriber based on their own preferences (although dietary requirements and allergies are not catered for at the moment), and sent out using Royal Mail in a shoebox sized box. I was quite excited when my box arrived – it’s always fun to get a surprise in the post, and I had no idea what would be inside the box. Each box is guaranteed to have at least 12 different snacks in it, and mine did have exactly 12. I felt it was quite heavy on the crisps and savoury, and there weren’t enough sweet snacks for my liking, but that’s just me. I guess if I subscribed I could give my preference for more sweet snacks. The two strangest items in some ways were the noodles and seaweed. The noodles look really good, and Nissin is a brand I trust and like, but I am surprised to find noodles in a snack box. The seaweed also surprised me as I wouldn’t normally think of eating seaweed on its own like this (are you meant to?!). I think I’ll save that for the next time I cook up some sticky rice. Out of the sweet items, my favourite was Yan Yan. I’ve had this before, and although it’s sickeningly sweet I do quite like dipping the biscuits in the vanilla creamy stuff. The chocolate wafers were average, and tasted like something you might get free with a coffee in a cafe or hotel, and I’m afraid the coffee candies were disgusting. The EDO Pack gummies were good, but it was a shame there was no information on them or with them. I think I have seen sweets like this in Japan before though, so perhaps they were Japanese. So, would I subscribe to Chimasu? Probably not, but I can see why it might be good for some people. I’m lucky – working where I do there is a pretty constant stream of Japanese snacks coming through the office, so I don’t often feel like I miss these things too much. It’s also quite easy for me to go out and buy Japanese and Asian snacks if I want to. I imagine if I lived somewhere more rural or even if I still lived in Bognor Regis, receiving a snack box like this every month would be like heaven! Chimasu boxes start from £14 per month (if you are getting an annual subscription), and delivery is free in the UK. Readers of Haikugirl’s Japan can get £5 off their first box using the code “CHIMASU15” at checkout. Find out more at Chimasu.com! Would you like to try a Chimasu oriental snack box? Just leave a comment on this post letting me know all about your favourite Japanese snack! Deadline for entries is Friday 9th October, and entrants must have a UK postal address. Please note that only comments left on this blog post will be accepted as competition entries, and comments left via social media (Facebook, Twitter, etc.) will not be counted. This competition is open to people with a UK postal address only. After the closing date has passed, a winner will be selected at random and that person will be contacted directly using the email address provided. The winner will need to supply a postal address for the prize to be sent to, and the prize will be mailed out directly by Chimasu. If the selected winner does not respond with a postal address within 14 days of being contacted another winner will be selected in their place. rice crackers, those are my favourites and there are so many varieties of them. also wasabi crisps. not sure if that is japanese. Thanks for your comment! Rice crackers are great, aren’t they? 🙂 Well, wasabi is Japanese so I would say wasabi crisps sound pretty Japanese too! To bad I’m not from UK D: . Anyway, those onion rings looks awesomeeee. I’ve never tried any japanese snack, but they actually sell yanyan here. I didn’t know it was japanese, I used to eat that a lot when I was a child. Ah actually YanYan isn’t Japanese. The packet I had said it was from Malaysia. I know what you mean – it’s hard to choose a favourite, isn’t it?